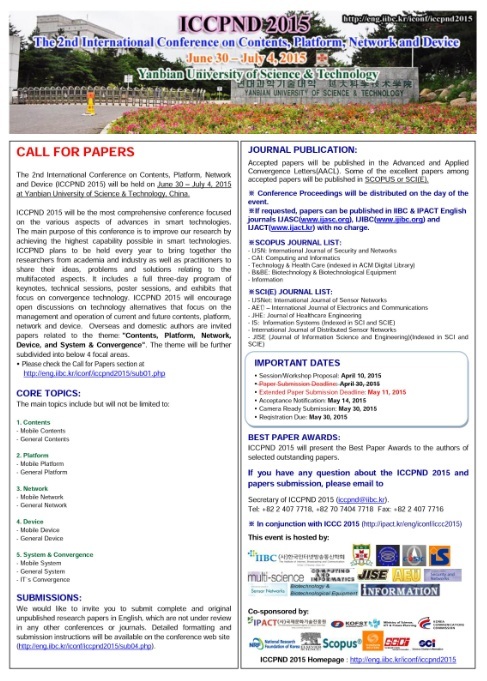 The 2nd International Conference on Contents, Platform, Network and Device (ICCPND 2015) will be held on June 30 – July 4, 2015 at Yanbian University of Science & Technology, China., China. ICCPND 2015 will be the most comprehensive conference focused on the various aspects of advances in smart technologies. The main purpose of this conference is to improve our research by achieving the highest capability possible in smart technologies. ICCPND plans to be held every year to bring together the researchers from academia and industry as well as practitioners to share their ideas, problems and solutions relating to the multifaceted aspects.